Hypermodernity Got Ya Down? Put a Bonnet On It! I have never read an Amish romance novel. I tried once—not very hard—and couldn’t do it, couldn’t even get past page three. 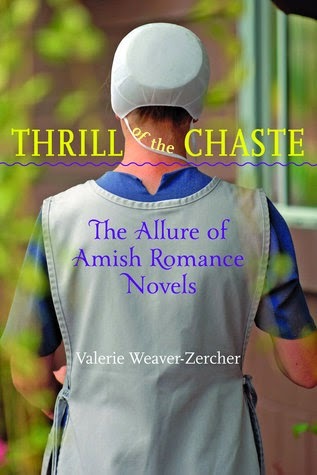 However, I did just now manage to read with great delight, cover to cover, Valerie Weaver-Zurcher’s new book, The Thrill of the Chaste: The Allure of Amish Romance Novels. Unable to resist that delicious title, I dove into this fascinating cultural study of the Amish romance phenomenon, because, like anyone who follows the publishing industry, I want to know: why are readers so crazy about Amish romance? This is a recent and feverish craziness. Weaver-Zurcher, a Mennonite whose expertise nicely straddles the academic and trade publishing worlds, explains that the Amish romance genre putted along at just a few new titles a year for the first few years of the millennium, but in 2008 this jumped to twelve new titles, then shot to 45 in 2010 and 85 in 2012. If you were so inclined today, you could purchase a new Amish romance title every four days (that’s the rate of release anyway). The top three Amish romance authors have together sold about 24 million books. And this analysis only accounts for “inspirational”—that is, “clean,” Christian—Amish romance released through publishing houses. It does not count figures for re-releases, self-published Amish romance, Amish fiction in other genres such as mystery, novels about other “plain” people such as Mennonites, or Amish/vampire novels, or LGBT-themed Amish fiction. Yes, there are such things. Not kidding. Weaver-Zurcher applies literary and cultural theory with a light touch, examining the Amish romance phenomenon from various angles. She considers the history of the genre, production and readership, literary quality and whether that even matters, accuracy and whether that even matters, the wrinkly relationship between evangelicalism and Amish fiction, the problems of exoticizing/domesticating/commodifying/appropriating the Other, and perhaps most importantly, how a variety of readers use and think about and are (or are not) influenced by Amish fiction. She is never disdainful of the genre, its readers, or the publishers, but consistently cheerful, fair-minded, and curious. But never mind these intriguing questions connected to Amish readers. What about us English? What, after all, does explain the astonishing surge in popularity of what might seem a niche genre about a religious group that composes only one-tenth of one percent of the U.S population? Well, naturally, it’s complicated. But Weaver-Zurcher’s best answer seems to be: hypermodernity, including hypersexualization. With due thanks to theorists Gilles Lipovetsky, Jean Baudrillard, and Kenneth Kammeyer, Weaver-Zurcher observes that in a culture characterized by “hyperconnection, hypertext, hyperreality, hypercapitalism, hyperindividualism, hyperconsumption, hyperintelligence, hyperterrorism,” we’re bound to long for a simpler and slower way of life. And in a pervasively “pornified” and raunchy popular culture, we’re bound—well, at least some of us—to long for modesty and chastity. Suddenly Amish-world seems a welcome respite—serene farms, handmade quilts, quiet evenings spent in quiet conversations with beloved family, stalwart community, a life of decency and piety, and of course, hearty, homemade meals with pie for dessert. Now this part I understand. Not the pies, but the longing for a respite from hypermodernity. The other night I went to a family birthday dinner in which conversation for most of the evening fluttered around everyone’s latest device: mini-ipad vs. Kindle, how to get wifi on one’s phone, the latest operating system upgrades. And I can’t even blame this on the young people. The median age of the gathered relatives was 47. For the record, I’m not the only grump tired of not being able to look people in the eye because they’re preoccupied with their cellphones. Even hip, postmodern author Jonathan Foer isn’t happy about this. And then there’s hypersexualization. I was appalled to read the copy on a little packet of hair product my stylist gave me. It stated that if I used this product, I would receive, among other things, at least eight invitations to engage in casual sexual encounters, except the word used to describe said encounters began with F, its crudity lightly disguised with asterisks. On conditioner packaging! The company that made this product is based in Australia, but that’s no excuse. So I get that we live in a hypersexualized, hypermodern world and that reading is one way to retreat to an alternative universe. As Weaver-Zurcher observes, “literature can serve as a semaphore for the subculture that produces and consumes it, a flag by which it expresses concern regarding contemporary cultural directions.” In other words, we create and consume the fictions we need in order to deal with our anxieties, and apparently, many readers find Amish life an effective tonic. At least a fictionalized version of Amish life, nicely adjusted to give readers a pleasant dip—or as Weaver-Zurcher describes it, “imaginative transport”—in another world through fiction. This is not a bad thing, necessarily. It’s one of the most important cultural purposes of fiction in general. So I’m not as inclined as I used to be to be, thanks to The Thrill of the Chaste, to regard this genre with disdain. I now have a much clearer understanding of Amish romance, its readers, and its cultural uses—which are not so different from the ways we use higher-brow genres. In any case, I have my lowbrow “vices,” too, my imaginative transports of choice to help me escape the perils of hypermodernity. I used to love Dr. Quinn, Medicine Woman, for example, and more recently, the wonderful/awful show Merlin. Amish romance is still not going to be my choice, but hey, there are worse ways to cure what ails you when you’re suffering from the hypermodernity blues. Previous Post"Danger: You Could Die Here in Paradise"